Team with friends to tackle monsters for a great cause, that being virtual loot. What, you expected to make a charitable donation? After months of waiting, two things happened today. 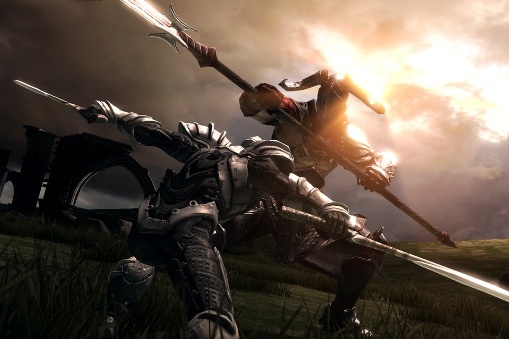 First, ChAIR Entertainment released the long-awaited ClashMob update for Infinity Blade 2, and second, we just realized that ClashMob is a delightful play on the words "Flash Mob." That aside, yes, you can download ClashMob free of charge. This DLC lets players team up for massively-social challenges, where they band together to complete a series of tasks and hopefully acquire hard-to-find items, including more powerful swords. They can also post accomplishments on Facebook and Twitter while recruiting friends to join the mob. On top of that, the update adds new characters, loot and a new Gem Forge feature that allows custom gem crafting. And to top it off, Chair dropped the price of the game from $6.99 to $4.99 for a limited time. 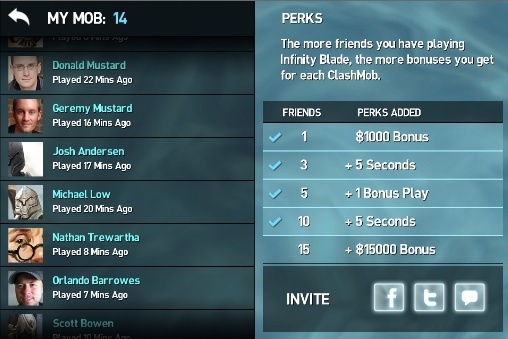 "We're super excited to launch ClashMob and introduce Infinity Blade 2 fans to an innovative new mode of play that taps into the unique and social nature of today's mobile devices," said Donald Mustard, creative director, ChAIR Entertainment. "Massively multi-player gaming is something that resonates deeply with our audience and we feel the ability to now deliver this type of gaming experience, asynchronously on a mobile device is a real game changer." Personally, we can't wait to check this out, and plan to report back sometime today. You know, after getting done working for the man.